Relax with the firm support and double the down of our best-selling, pillow-in-a-pillow design. An increased amount of fluffy down surrounds a feather inner pillow giving you plush cushioning and incredible comfort. Great for side and back sleepers. From the first night's sleep, I have been pretty much free of that "pain in the neck" I've experienced for years. Thank you, Pacific Coast Bedding. No you’re not dreaming…yet. This is our incredible pillow-in-a-pillow, our best-seller due to its fluffy, yet supportive two-in-one design. A double amount of 550 fill power Hyperclean® down surrounds a springy inner pillow of Resilia® feathers for plush, inviting comfort and specialized firm cushioning that's excellent for side sleepers and those looking for extra support. A 2” gusset, or fabric wall, around the perimeter of this incredible pillow allows maximum loft from end to end and we’ve finished it off with our signature printed navy blue cording. It's easy to see why this pillow is featured in fine hotels around the globe. Machine wash and dry for easy care. This pillow is also available in soft and medium support. Our best selling design, the Double Down Around® FIRM is like two pillows in one. An inner pillow is filled with extra feathers for resilient FIRM support. 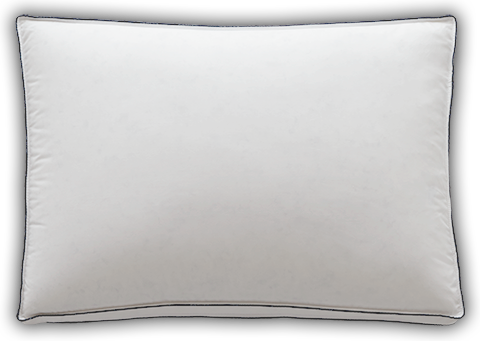 Surrounding this is an outer pillow filled with double the down of our DownAround® pillow. This incredible combination allows you to enjoy extra fluffy comfort as you lay your head on the pillow - with springy, resilient firm support that lasts through the night. This pillow is best for side and back sleepers. Standard: 18" x 24" x 2"
Queen: 18" x 28" x 2"
King: 18" x 34" x 2"